A campaign worker for President Bush said on Thursday American workers unhappy with low-quality jobs should find new ones -- or pop a Prozac to make themselves feel better. "Why don't they get new jobs if they're unhappy -- or go on Prozac?" said Susan Sheybani, an assistant to Bush campaign spokesman Terry Holt. The comment was apparently directed to a colleague who was transferring a phone call from a reporter asking about job quality, and who overheard the remark. When told the Prozac comment had been overheard, Sheybani said: "Oh, I was just kidding." Myth or fact? We will refer to some survey data from the 2004 MARS study. This is a mail survey of 21,054 adults in the United States conducted during the first quarter of year 2004. Among the survey respondents, 1.5% said that they had taken Prozac in the last 12 months. The following chart shows the incidences by employment status. Certainly, the incidence of Prozac usage is significantly highest among the unemployed persons. But things are never that straightforward. Most things in life are not free, and this is where economic reality butts in. Fact #1: Prozac costs money. Fact #2: Unemployed people have less money. Although Prozac may be the prescribed solution, one must be able to afford it. In the next chart below, we show the incidences broken down further on whether the survey respondents have prescription drug coverage or not. 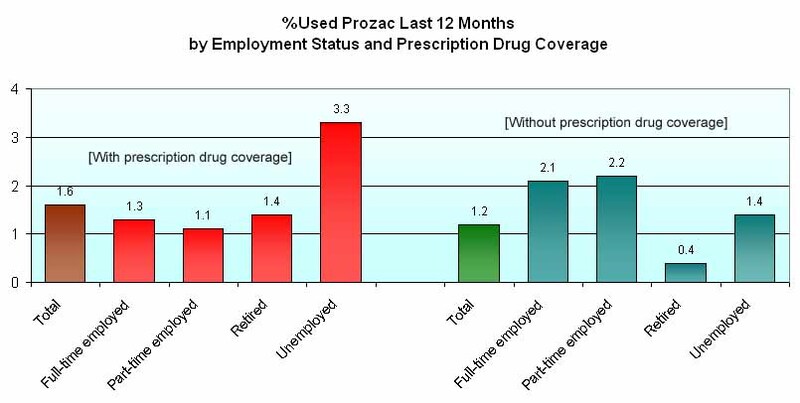 Indeed, among those with prescription drug coverage, the incidence of Prozac usage is signfiicantly higher among the unemployed. But among those without prescription drug coverage, the incidence among the unemployed is in fact lower than those who have jobs. Certainly, the Prozac solution to the unemployed problem should be preceded by a universal prescription drug coverage program, which will never happen anyway. 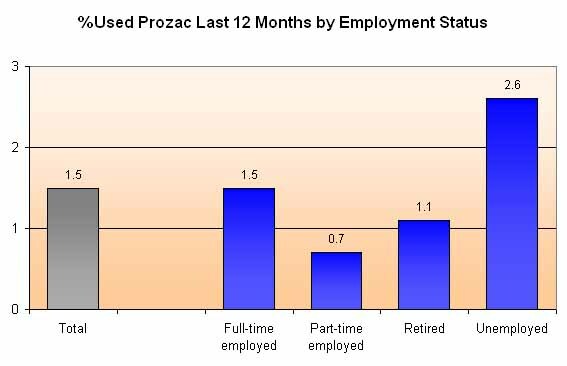 Prozac is obviously not a solution to the unemployment problem. Prozac would be a cynical way of treating a symptom rather than dealing with the root causes of depression. In her best-selling memoir Prozac Nation, Elizabeth Wurtzel writes, "I can't help feeling that anything that works so effectively, that's so transformative, has got to be hurting me at another end, maybe sometime down the road ... I don't know if there are any statistics on this, but how long is a person who is on psychotropic drugs supposed to live? How long before your brain, not to mention the rest of you, will begin to mush and deteriorate?" Expressing her concerns to her psychiatrist, Wurtzel says, "Come on, level with me, anything that works this well has got to have some unknown downside....He says a bunch of reassuring things, explains over and over again how carefully he is monitoring me -- all the while admitting that psychopharmacology is more art than science, that he and his colleagues are all basically shooting in the dark. And he acts as if a million doctors didn't say the same things to women about DES, about the IUD, about silicon breast implants, as if they didn't once claim that Valium was a nonaddictive tranquilizer and that Halcion was a miracle sleeping pill."